Red Rooster will now be using ebikes to deliver its food to customers around Australia. Across the next few months, a fleet of purpose built red and white ebikes will be released throughout the Red Rooster store network to assist with deliveries. The bikes will join Red Roosters’ fleet of delivery cars which have been used by the fast food chain since 2014. 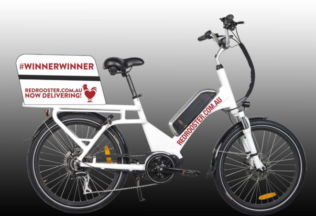 General Manager of Delivery at Red Rooster, Nathan Kelk, said the ebikes will help take Red Rooster’s delivery to the next level. “Not only are they economical and eco-friendly, but they will play a major role in making delivery experience even faster and more convenient for our customers,” Kelk said. The introduction of the ebikes comes after Red Rooster worked to reduce its delivery wait times in 2017 and the recent release of its latest delivery innovations including ‘reorder your last order’ technology, four click ordering and GPS tracking od deliveries. Red Rooster is part of the Craveable Brands network which also includes Oporto and Chicken Treat. Chobani is selling a limited batch of mandarin flavoured yoghurt in celebration of Chinese New Year.